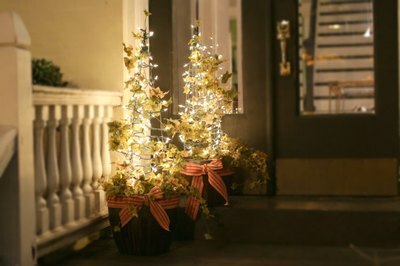 Transform tomato cages and garden planters into a welcoming pair of illuminated holiday topiaries with the help of string lights, floral ivy and festive ribbon. Instead of leaving these gardening staples in winter storage, make them work double-duty for a budget-friendly holiday update. 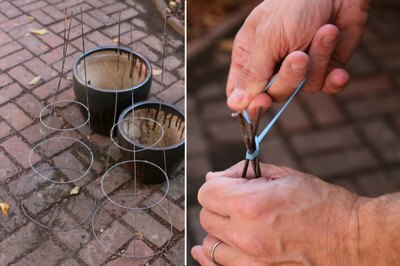 When turning a tomato cage on its base, the support stakes come together to form a point, resembling a Christmas tree or topiary shape. Secure the three tomato cage support stakes together with a rubber band to form a coned tree shape on each cage. To make a standard tomato cage base fit most any size planter, use wire cutters to snip an opening into the base ring of the cage. Doing so will allow flexibility to either overlap the ring ends to fit securely inside a smaller planter, or alternatively open to extend securely around the outside rim of a larger planter. This is also one way to achieve a varied look in size, even if starting with the same standard-size cages. 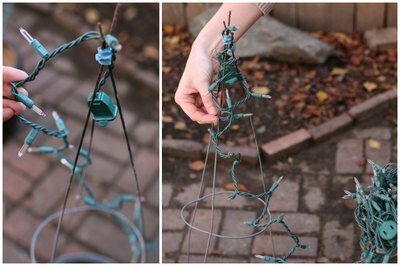 String the lights on the tomato cage. Position the female end of the plug just inside the top points of the cage. Wrap the light cord around the top points to conceal the rubber band and end of the plug before continuing to wrap evenly down and around the cage. Where the base of the cage meets the rim of the planter, wrap the excess cord once around cage support to secure in place. This will act as the backside of the topiary where the extension cord can be plugged in. 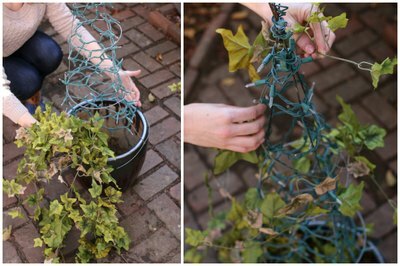 Brush out the floral ivy bunch so each vine is workable. Insert the base of the ivy bunch into the center of the tomato cage. Wrap longest vines in a loose, natural-looking spiral up and around the tomato cage, securing with two to three twist ties to keep their shape. 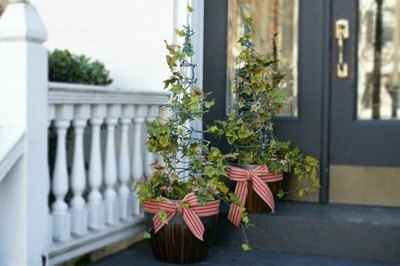 Allow shorter vines to remain loose, overflowing out from the base of the planter as natural ivy would. 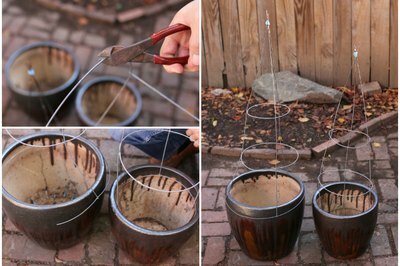 Cut at least 7 feet of burlap wired ribbon to wrap around the base of each planter. Finish with a simple bow, cutting edges on an angle. Wired ribbon is lined with small wires along each edge of fabric, making it easier to manipulate and hold the final shape. The ribbon will help conceal the overlapped base of the tomato cage on the larger planter, and tie in a seasonal, festive effect for the topiaries. Position topiaries on a covered stoop or just inside the entryway. 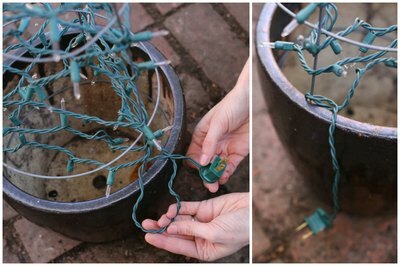 Use an extension cord to plug them in and illuminate.